At the start of this year, a British businessman named Adam Robson received some awful news. Mr Robson runs an English company called Torotrak that invents fuel-saving contraptions aimed at solving one of the auto industry’s great dilemmas: how to make a petrol car that is green enough to meet tightening pollution rules but does not feel like a lawnmower to drive. One of Torotrak’s most promising gadgets has long been the V-Charge, a smarter version of a turbocharger that took six years to develop. In the middle of last year, Mr Robson began pitching it to the world’s top auto component and carmakers, including General Motors, Volkswagen and Toyota. About a dozen said they were interested. But by January, things changed. Company after company turned him down. Suddenly, none wanted new products for cars running on fossil fuels. Torotrak was hit hard. Its shares plunged 40 per cent. It has shut down one of its main engineering sites, making about 40 staff redundant, and put the V-Charge on ice. It is now focusing on heavy-duty diggers and other gear it hopes will not go electric any time soon. Mr Robson’s experience is just one example of the disruptive impact of green energy on companies — and entire industries — around the world. After years of hype and false starts, the shift to clean power has begun to accelerate at a pace that has taken the most experienced experts by surprise. Even leaders in the oil and gas sector have been forced to confront an existential question: will the 21st century be the last one for fossil fuels? This clean energy disruption has just started and what is striking is how much of a financial impact it is already having on some companies,” says Per Lekander, a portfolio manager at London’s Lansdowne Partners hedge fund, who has tracked global energy markets for more than 25 years. The shift has come as increased government efforts to curb climate change and smog have driven down costs and spurred technical advances, creating a green energy industry that looks nothing like it did a decade ago: expensive, sluggish and German. Today, China and India have picked up the baton and are driving a sector that has spread to every continent. The result was a banner year for green energy in 2016. None of this means the problem of climate change has been solved, or that fossil fuels will vanish in the near future. Oil, gas and coal still account for about 86 per cent of the energy keeping the world’s lights on, cars running and homes warm — a share that has barely changed in 25 years. Coal and gas-fired power plants are still being built, especially in the developing world where 1.2bn people lack electricity. Modern renewables, in contrast, are growing from a tiny base and are often less dependable than dirtier power generators that do not rely on the weather. Wind and solar power accounted for a puny 4.4 per cent of global electricity in 2015, and big battery systems can only store enough power to satisfy a few seconds of global electricity demand, says the International Energy Agency. Electric vehicle sales last year were just 0.9 per cent of all vehicles sold, according to the EV-Volumes consultancy. ● In sunny Nevada, casino companies are unplugging from the state utility. NV Energy lost nearly 6 per cent of its customer base virtually overnight in October after MGM Resorts International and Wynn Resorts agreed to pay a combined $103m to defect and buy their power elsewhere. MGM cited “the sharp decline in the cost of renewable energy” as a primary driver of its decision. Caesars later did a $47.5m deal to quit. ● In Chile, shares in some of the country’s electricity companies, including AES Gener and Colbún, slid in August after they lost out in an auction that pitted renewables against fossil fuel generators for 20-year power contracts. Among the winners was a solar scheme that undercut fossil fuel bids with a record low price of $29.10 per megawatt hour. ● In Australia, a $200bn investment splurge in liquefied natural gas projects has put the country in position to overtake Qatar as the world’s largest LNG exporter. But new schemes have come online as LNG prices have collapsed amid fears of a supply glut that some economists say could linger as renewables become more affordable. “It just makes sense for countries to think about renewables as an alternative,” says Jürgen Weiss of the Brattle Group consultancy. ● In Michigan, car parts supplier BorgWarner, which makes most of its money selling components for conventional combustion engine vehicles, made one of the largest acquisitions in its 89-year history in 2015, when it paid $950m in cash for US electric motor maker Remy International. BorgWarner’s shares subsequently dived but analysts say the industry’s shift to electric cars means the deal made sense. “Without Remy, the narrative of their long-term value would have been difficult to justify,” says Adam Jonas, head of global auto research for Morgan Stanley. When the definitive history of the energy transition is written, the taxpayers of Germany will deserve their own chapter. They bankrolled the green energy revolution known as the Energiewende, pioneering generous subsidies nearly 20 years ago that helped drive renewables up from 9 per cent of Germany’s electricity mix in 2004 to 32 per cent last year. As other European nations — and some US states — boarded the green power wagon, it kindled a wave of demand for wind turbines and solar panels that helped drive costs down worldwide. Solar’s price fall was especially steep after a Chinese manufacturing boom spurred global over-supply. The result was doubly miserable for conventional fossil fuel generating companies: renewables crowded them out while simultaneously driving down wholesale power prices, causing billions of euros in losses. Germany’s two largest power utilities, Eon and RWE, shook the industry last year when they split themselves in two, hiving off struggling fossil fuel operations from cleaner power businesses. “For two real pillars of the German corporate world to radically break themselves up is something I cannot recall ever seeing in my lifetime,” says Peter Atherton, a UK power analyst. Yet a lot of places have begun to look more German this year — even the US, where President Donald Trump wants to unleash more fossil fuel production. The US solar industry employs more than twice as many workers as the coal sector, a report showed in February. Manhattan has more Tesla charging spots than petrol stations, though many are in fee-paying parking garages. And across the US, where power companies are facing lower wholesale prices thanks to cheaper natural gas, renewables are adding pressure too — even in unlikely spots such as oil-rich Texas. Texas now has more installed wind power capacity than Canada and Australia combined. If it were a country, it would rank as the world’s sixth-largest wind power, after China, the US, Germany, India and Spain. NRG, the second-largest US power producer, has about a quarter of its generation capacity in Texas and has been reshaping its business so it relies less on squeezed wholesale power prices. Mauricio Gutierrez, NRG’s chief executive, warned in February that companies failing to do this would be rendered “obsolete” by the “unprecedented disruption” in the industry. Yet fast-growing industrialising nations are seeing some of the most profound changes. Towering over them all is smog-choked China, which has become a green energy juggernaut after designating renewables a strategic industry. China has more than a third of the world’s wind power capacity; a quarter of its solar power; six of the top 10 solar-panel makers; four of the top 10 wind turbine makers and more battery-only electric car sales last year than the rest of the world combined. India is eager to follow: it built one of the world’s largest solar photovoltaic farms last year; ranks fourth in the world for wind power capacity; and could become the world’s third-biggest solar market this year. It also wants to boost its use of electric cars. The world has been through energy transitions before, often shaping the course of human history. The age of wood gave way to coal in the 1800s. Coal was in turn squeezed by oil and natural gas, transforming the fortunes of Middle Eastern desert kingdoms. Such shifts usually take decades. But the growth of the latest one has prompted some to wonder if the age of fossil fuels might fade faster. Some mainstream thinkers are dubious. Prof Smil says “naive” people who are “enchanted” by the idea of a rapid end to fossil fuels ignore the fact that it has typically taken 50 to 60 years for a widespread shift from one dominant fuel to another. As coal gradually displaced wood, for example, it reached 5 per cent of all fuel energy in 1840 but was still only about 50 per cent by 1900. “People want to be deceived,” he says in an interview. There is a dearth of green alternatives to the fossil fuels used to make steel, cement or plastics, he adds. And replacing a global fossil fuel energy system that took an estimated $25tn to create over the 20th century with today’s crop of renewables is a job that will occupy us “for generations”. Still, a much-discussed paper published last year by Professor Benjamin Sovacool of the University of Sussex suggests energy transitions in some places can be speedier. Nuclear power in France went from 4 per cent of the country’s electricity supply in 1970 to nearly 40 per cent in 1982, for instance. Others think the latest energy transition could be swifter because it is driven by deliberate efforts to curb climate change, rather than chance. Countries around the world have adopted more than 1,200 climate change laws, up from about 60 two decades ago, a study this month showed. Renewables now receive direct policy support in an estimated 146 countries, nearly triple the number in 2004. That backing has seen the cost of wind turbines fall by nearly a third since 2009 and solar panels by 80 per cent, says the International Renewable Energy Agency. This underlines an advantage for renewables: unlike coal, oil or gas, every country has wind and sun. As panel and turbine costs have fallen, “It is as if every country in the world woke up one bright morning to find that it had a North Sea at its disposal”, says London energy analyst Kingsmill Bond. He says the more relevant point for investors is not the decades it may take for fossil fuels to be eliminated but the fact that small falls in market share can have a profoundly disruptive impact. Exhibit one: most major carmakers are planning new electric models even though fewer than 1 per cent of cars sold each year have a plug. There is another reason some energy industry watchers expect the green power sector to accelerate: the more costs fall and technologies improve, the less it needs conventional subsidies. This is one reason countries managed to adopt the global climate change agreement in Paris in 2015 after years of negotiations, says Christiana Figueres, the former UN climate official who helped seal the accord. “Switching away from coal no longer looked impossible, even in developing countries,” she says. Costs are expected to fall further as countries spurn expensive subsidies guaranteeing set prices for generators in favour of competitive auctions or tenders. The amount of auctioned renewable electricity last year was triple that in 2015, according to Bloomberg New Energy Finance, while the average global price of auctioned solar power has plummeted fivefold since 2010. One of the most striking auction results came in Germany in April when Denmark’s Dong Energy, the largest builder of costly offshore wind farms, said it would build two new schemes without subsidies, relying instead on market prices alone. Advances in wind technologies — including the prospect of much more powerful turbines — were one reason for Dong’s move, a step others are expected to follow. Mainstream Renewable Power, an Irish wind farm developer, shows how new technology is making a difference. It was a winner in last year’s power auctions in Chile, which require customers’ demand for electricity to be met 24 hours a day. That means generators face the potentially pricey risk of buying power on the spot market to make up for any shortfalls. Mainstream says more precise wind measuring technology makes it easier to predict how much extra power is needed, and therefore whether wind projects can be profitable. Investors say important trends like this are obscured in countries where the existence of climate change is still so widely contested that the scale of the energy transition is under-estimated. Even the experts have been caught out by the pace of the shift. In 2010, IEA projections suggested it could take 14 years before there was 180 gigawatts of installed solar capacity. It took less than seven years for the world to reach more than 290 gigawatts, nearly the entire generating capacity of Japan. Still, some predictions have proved overblown. Former US President Barack Obama said that by 2015, the US could be the first country with 1m electric cars. Only about 400,000 materialised. Some green energy veterans bruised by past setbacks think there is a reason to be more optimistic today: batteries. One reason for his optimism is what he calls the “tectonic plate-shifting” in the car industry that is driving down the cost of energy storage. Storing clean power has long been a holy green grail but prohibitive costs have put it out of reach. This has begun to change as battery production has ramped up to meet an expected boom in electric cars. Could this led to a China-led glut like the one that helped drive solar industry write-offs and crashing prices after the global financial crisis? “It’s something to watch,” says Francesco Starace, chief executive of Italy’s Enel, Europe’s largest power company. The thirst for electric cars, not least in China, means “the dynamics of demand are completely different” for batteries than for solar panels, he adds. Tesla finished a similar system in Hawaii in October and its chief executive, Elon Musk, made a characteristically flamboyant offer this year — via Twitter — to build a much larger one within 100 days to help fix power outages in southern Australia. For all the excitement about batteries, the technology is still not ready to let householders in any part of the world stick a solar panel on the roof, a battery in the garage and abandon grid power completely. It would cost hundreds of thousands of dollars in snowy places like Nebraska and probably require an extra garage to house all the batteries, the CLSA brokerage calculated last year. However, other analysts say investors need to pay attention to the disruption that even partial grid defection could cause in places where batteries make more financial sense. In Australia, where household electricity prices nearly doubled in the decade up to 2014 and rooftop solar levels are among the world’s highest, more than 6,700 battery systems were sold last year, up from 500 in 2015, says the solar consultancy SunWiz. By 2020, about 1m homes could have batteries, according to Morgan Stanley analysts. “We think most incumbent utilities downplay the earnings risks from solar and battery take-up,” the bank said last year. “All utility investors should monitor Australian market developments” to anticipate how the market will evolve elsewhere, it added. Battery companies flocking to Australia say it is only one example of a new breed of “prosumers”, people using renewables and batteries to produce and consume their own power. “We were doubted before,” says Philipp Schröder, managing director of Germany’s Sonnen home battery group. He says big utilities are copying his company’s business model now, purely because “the economics are right”. In quake-prone Japan, a hotbed of battery technology, industry leaders say it is inevitable that home solar-storage systems will become commonplace. “In future we think all new houses will generate and consume their own electricity and grid power will only be used for industry,” says Hiroichi Yoshida, founder of Eliiy Power, a lithium ion battery-maker that specialises in solar storage systems. When a powerful earthquake rocked the southern Japanese city of Kumamoto last year, black-outs plunged most homes into darkness for nearly a week. But the lights stayed on in at least 20 houses with solar-storage units, says Eliiy, which is planning to open a third battery production plant in 2019 as sales rise. Meanwhile, some fossil fuel companies are starting to put serious money into green energy. Seven oil and gas groups, including France’s Total, Royal Dutch Shell and Norway’s Statoil, have together invested almost $15bn in renewables over the past four years, according to the Oil and Gas Climate Initiative industry group. Total bought France’s Saft battery company last year for almost €1bn, having already acquired a controlling stake in a US solar company, SunPower. Norway’s Statoil is spending $500m a year on clean energy projects and expects to spend even more after 2020, says Irene Rummelhoff, head of the company’s “new energy solutions” unit. “It is the first time we’ve devoted this much money to clean energy,” she says, adding she expects to see more companies follow suit amid the “tremendous shift” of plummeting renewables costs. “Clearly it is to some degree a threat but at Statoil we have chosen to see it as an opportunity,” she says. The company has six offshore wind projects operating or in development, including an innovative floating wind turbine park off the coast of Scotland it plans to hook up to a battery system next year. Royal Dutch Shell is also ploughing into offshore wind farms, to the point that Henrik Poulsen, chief executive of Dong Energy, says he now regards both Shell and Statoil as “competitors”. But oil and gas companies may need to act faster if the ambitious plans of other large energy companies succeed. France’s Engie, for example, is investing €1bn over three years on new energy technologies that could strike at the heart of fossil fuels. The company’s head of research, technology and innovation, Thierry Lepercq, says this includes creating zero-emissions power plants that generate electricity for “the Rio Tinto price” — the price that the metals and mining company seeks when deciding where to build a new smelter. None of this means the future of clean energy will be entirely smooth. Indeed, its very success poses a raft of questions for governments that some have barely contemplated. Chief among them: what to do with power markets that were never designed for millions of people turning their rooftops into mini power stations? How to pay for upgrading grids to cope with the influx of all this renewable power? What to do about incumbent companies calling for the brakes to be slammed on to protect them from green power incursions? Then there is Mr Trump, who is seeking to unwind the clean power policies of his predecessor. Will the Fed and U.S. Monetary Policy Ever Get Back to "Normal"? In its quest to save the U.S. economy during the financial crisis, the Federal Reserve went where it had rarely — or even never — gone before. The central bank slashed the target for its key short-term interest rate, the federal funds rate, to nearly zero and pumped a record $2 trillion into the economy by buying troubled mortgage-backed securities and other assets, ballooning its balance sheet more than four-fold. Now, as the economy seems to be finding solid footing, the Fed is looking to resume historically normal, pre-Great Recession operations. At least, the Fed is moving cautiously. “Moving too quickly could undo much of what the economy has already accomplished,” Conti-Brown notes. Rushing back into “a world where the Fed has a less than $1 trillion balance sheet, with interest rates in the 3% to 4% range, could deal a serious blow to the fragile, if not very long, economic recovery.” He notes that Fed critics want the central bank to move more quickly in case inflation surges. While inflation is currently under control, Conti-Brown says, their argument is that it might still spike. Tayyeb Shabbir, Wharton adjunct professor of finance, agrees that the Fed under Chair Janet Yellen “seems to be moving at just the right speed.” But Shabbir, whose last book on financial crises was co-edited by Nobel Laureate and Wharton economist Lawrence Klein, sees a new normal coming. “Monetary policy will regain its normal functionality; expectations of consumers, investors and all economic agents in general will return to ‘normal’ — which may not be the exact reversion to the pre-crisis level but it will be normal in terms of … functionality.” But there will be a residual effect. “Having hit the gas pedal to the floor once, albeit for a protracted time, should not preclude it [from] working more ‘normally’ once the extreme conditions have disappeared,” he adds. Buoyed in part by low interest rates, the U.S. housing market started flourishing in the 1990s and accelerated in the mid-2000s before reaching a peak in 2006, seeing a boom in construction, home prices and credit. According to the Federal Reserve Bank of Richmond, “average home prices in the United States more than doubled between 1998 and 2006, the sharpest increase recorded in U.S. history.” More consumers borrowed money to buy homes: Mortgage debt rose to 97% of GDP in 2006 from 61% in 1998. Typically, people with poor credit — subprime borrowers — had a tougher time qualifying for mortgages. But during the housing bubble, many more mortgages were being taken out and repackaged into complex securities, then sold off to investors. Thus, the risk of lending to borrowers shifted away from the bank or mortgage lender. This led to lenders qualifying more subprime borrowers for home loans, particularly into adjustable rate mortgages; when rates reset they refinanced or took out another mortgage. This pushed up home prices to sometimes stratospheric levels. But the gravy train couldn’t last forever and mounting defaults on mortgages put heavy pressure on banks and institutional investors who bought these securities. (These securities were so complex that even ones with subprime mortgages received high grades from credit ratings agencies.) Investment banks Lehman Brothers and Bear Stearns, which loaded up on these securities, saw the value of their holdings plunge so much they went out of business. AIG, which insured many of these securities, also was in danger of collapse until the Fed rescued it. Under Fed chair Ben Bernanke, the Fed determined that the fall of AIG would take others down. By intervening this way, the Fed deviated from its usual role as the banks’ banker. In the same way as consumers open accounts in a bank, banks have accounts — or reserves — with the Fed. Historically, the Fed mostly lent and supported just banks, with some rare exceptions. But in the escalating financial crisis, it engineered the rescue of AIG, intervened in the sale of Bear Stearns to JPMorgan Chase and expanded its lending to include non-banks. The Fed wanted to make credit more freely available because it was afraid that due to the big losses suffered by banks, they would freeze credit and severely limit lending, which would harm economic activity. A severe credit crunch, among other things, could lead to another Great Depression. Once the immediate crisis was averted, and the recession ended in 2009, the Fed worked to combat persistently weak economic growth through credit-easing — popularly known as quantitative easing (QE) but with differences from Japan’s program — by injecting money into the economy through purchases of longer-term bonds and mortgage-related securities from banks and others. This 2009 program ended in October 2014. The Fed undertook this program because even with the fed funds rate near zero, it was not enough to boost economic growth. Meanwhile, the Fed began paying interest on banks’ reserves for the first time, which helps the central bank hit the target for its key federal funds rate (the overnight rate for loans banks charge each other). It’s also an incentive for banks to keep money at the Fed. “A quickening economic recovery could provide incentives for banks to withdraw funds held as excess reserves at the Fed and inject them into the real economy,” said the Federal Reserve Bank of St. Louis. Shabbir observes that one “apparent paradox” in the economy is that the current rate of unemployment would typically warrant more “aggressive rate hikes than we have seen so far. However … the Great Recession and the deep changes that it has wrought in the structure of the U. S. labor market — such as the unprecedented, lengthy average duration of unemployment, relatively lower worker’s wage expectations and declining ‘union power’ — [have] cast doubts about the relative tightness of the labor market as traditionally understood in the pre-Great Recession era, which was a more close fit to the oft-mentioned ‘Phillips Curve’ relationship” — where wages rose slowly when the jobless rate was high, and vice versa. The Fed’s normalization plan calls for raising the federal funds rate away from zero (liftoff from the zero interest rate policy or ZIRP) and reducing its $4.5 trillion balance sheet. Normalization would entail that the fed funds rate revert closer to its pre-2008 average: 4.5% from January 1990 to December 2007, according to Shabbir. Currently, the fed funds rate target is 0.75% to 1%. The Fed has raised rates three times since December 2015 — the first time since 2006 — each by a relatively cautious 0.25%. Economists expect one or two more hikes this year. However, it is important to remember that the Fed’s normalization plan is contingent on continued growth in the economy and inflation staying near its 2% target. “It is really dependent on the strength of the U.S. economy,” says Wharton finance professor Joao Gomes. “The latest growth numbers were disappointing — we had a lot of weakness in various areas, like retail, for example. There are a lot of conditions for this ‘liftoff’” to happen. Moreover, political uncertainty and potential policy changes could dramatically alter the path of the economy. Meanwhile, the European Central Bank is looking to end its own quantitative easing program as green shoots appear in EU economies. “Europe is doing much better than last year, and the year before. You see growth pretty much everywhere,” Gomes says. The jobless rate has been falling across the board, he notes, even in troubled economies such as Italy, Spain and Portugal. Gomes concurs. “The main impact on long-term rates … is expectations about U.S. growth,” he says. “There will be some impact of monetary policy normalization, but again it’s really important to remember that the goal of the Fed is not to have much of an impact. So the phasing out of the balance sheet expansion will be as slow as necessary to make sure there won’t be a big noticeable impact. [The FOMC] will largely follow the real economy and try not to have long-term rates move in any dramatic way. If they do, they will just step back. They will reduce the balance sheet … slowly.” He expects the Fed’s balance sheet to remain huge in the next five to 10 years — or longer. For his part, Roussanov is not convinced that the low-growth narrative in the U.S. is entirely correct. None of that happened. Trump did not label China a currency manipulator upon taking office. When the US Treasury last month conducted its scheduled review of Chinese currency policy, it concluded that China was not a currency manipulator. Trump quickly reversed himself on the One China policy as well, telling Chinese President Xi Jinping that the United States would continue to adhere to it and inviting Xi to visit him at his Mar-a-Lago retreat in Florida. That meeting led to a trade negotiation led by Commerce Secretary Wilbur Ross in which China agreed to open its market to US beef and various financial services, and the US agreed to sell liquefied natural gas to China. The result will be a decline in the US trade deficit with China, with no increase in tariffs. Reducing the bilateral trade deficit will not decrease the overall US trade deficit, because that is the result of the difference between investment and saving in the US. A lower bilateral trade deficit with China will just mean a larger trade deficit – or a smaller surplus – with some other country. Nonetheless, while the Trump administration is wrong to put so much emphasis on trade deficits with individual countries, doing so in China’s case has had the favorable effect of leading to policies that reduce foreign barriers to US exports. Elsewhere in Asia, Trump warned South Korea and Japan during his campaign that they could no longer count on America’s decades-long security guarantee. But almost immediately after Trump assumed office, Defense Secretary James Mattis flew to Seoul to reassure the Koreans, and the administration moved ahead with installing the advanced Terminal High Altitude Area Defense (THAAD) anti-missile system in South Korea, despite Chinese objections. And then Mattis flew to Japan to offer the Japanese a similar reassurance of continued US military support. Likewise, candidate Trump, complaining that NATO’s European members had not met their commitments to spend 2% of GDP on defense, vowed to reduce US military spending in Europe. He also criticized NATO for being unprepared to join the US-led fight against the Islamic State (ISIS). And yet Trump has backed away from his threat, and the Europeans have moved a little in the direction that the US has urged. Trump’s proposed federal budget calls for an increase in US military spending in Europe, while NATO’s European members have agreed to increase their military spending toward the 2%-of-GDP goal (though not as rapidly as Trump would like). And the North Atlantic Council, NATO’s governing body, recently voted to join the campaign against ISIS (though not in a combat role). Trump’s campaign threat to tear up the North American Free Trade Agreement unless better terms could be agreed has led to renewed negotiations, led by the US Special Trade Representative. It is too soon to tell what will result from the talks. It is to be hoped that the emphasis will be on further reductions in specific trade barriers that impede US exports to Canada and Mexico. It would be a mistake, for example, to limit Canada’s lumber exports to the US on the grounds that the Canadian government subsidizes them. Import barriers would only hurt US builders and homebuyers. I don’t know why President Trump has shifted to positions so different from those he advocated during the campaign. Have his cabinet-level officials persuaded him that his earlier positions were wrong? Does he believe in delegating decision-making on these issues to those officials? Or were his campaign promises aimed at attracting voters rather than revealing his own views? We probably will never know. Domestic policy is different. The administration recently released a ten-year budget plan that has been rightly criticized for its lack of coherence and its failure to describe explicit tax policies. But budget policies are different from international security policies, because the US Congress makes the detailed decisions on spending and taxes. Trump’s plan proposes domestic spending cuts that he must know Congress will not accept. And the projection of a balanced budget at the end of the ten years is needed under congressional rules to make permanent whatever tax changes occur. But for the details of the potential tax changes, I still look to the plans developed over the past several years by House Speaker Paul Ryan and his colleagues. Despite Trump’s campaign (and his erratic statements and capricious tweets since he assumed office), his administration’s actual defense and trade policies are on the right path. I remain hopeful that the tax policies developed in the Congress will provide a framework for desirable reforms of personal and corporate taxation. From without and within, democratic institutions and ideals are under threat. 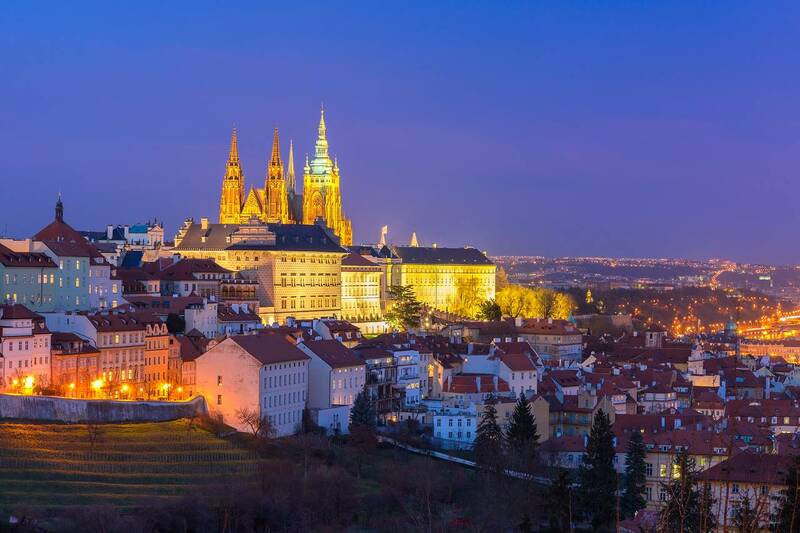 I visited the Czech Republic last week for the first time in more than two decades. It was not an entirely happy return. In 1995 I could still pass for young, and Europe was young again. As we convened in Prague for an international conference on civic education, everything seemed possible. If history had not quite ended, it was moving in the right direction, and more rapidly than sober analysts had thought possible. With Vaclav Havel in the Castle, the idealists had turned out to be the true realists. I landed in Prague this time under different circumstances. The surface was gleaming, but the spirit had darkened. Milos Zeman, the current Czech president, has adopted Vladimir Putin’s analogy between Kosovo’s independence and the annexation of Crimea; Mr. Zeman calls the conflict in Donbass a “civil war between two groups of Ukrainian citizens.” Like populists everywhere, he sharpens longstanding ethnic tensions for short-term electoral advantage. Students and intellectuals who spearheaded the Velvet Revolution sporadically demonstrate against him. As I walked the streets, I saw throngs of tourists for whom Prague was a charming visual backdrop and a fine place to shop. Dulce et decorum had given way to Dolce & Gabbana. The Prague Spring had become a museum exhibit; the lines were short. Along the banks of the river, Chinese brides shivered in their thin white wedding dresses as videographers barked orders. As I looked down from the Gothic-era Charles Bridge to the waters below, I pondered, not for the first time, the ancient wisdom of Heraclitus : panta rhei—everything flows. We cannot step into the same river twice; certainly not the Vltava. But I was not in Prague to lament a vanished past. Under the auspices of the National Endowment for Democracy and Forum 2000 (an organization Havel co-founded in 1996), a group of scholars and activists from around the world convened to explore current threats to democratic institutions and strategies for countering them. Despite our differences, we agreed on the big picture. The democratic wave that began in 1974 crested in 2006, and democracy has been on the defensive ever since. Democracy is now challenged from without, by increasingly self-confident and aggressive autocracies, and also from within, by ethnic antipathies, terrorism and sclerotic political institutions. These internal forces have built support for what Hungary’s Viktor Orban memorably dubbed “illiberal democracy”—an unfettered majoritarianism that is hostile to minority rights and political liberties and is conjoined with broad executive powers. Though vitally important, free and fair elections are only a part of what we must now defend. We must also shine an urgent spotlight on would-be autocrats’ use of majoritarianism to attack the outer ramparts of liberal democracy—constitutional courts and the rule of law; political freedoms of speech, press, assembly and association; and the rights of individuals and minority groups, including freedom of religion and conscience. We agreed on another key point: Although some citizens will value democracy as an intrinsic good, come what may, most will judge it by its performance over time. When economic growth slows and traditional sectors decay, when household incomes stagnate and large numbers of young adults cannot find jobs, when floods of immigrants and refugees appear to threaten the prosperity, security and even identity of longtime citizens, doubts about democracy’s capacity to meet public needs are bound to deepen. If existing domestic and international institutions are seen as standing in the way of effective responses, demands for political change will only intensify. We agreed, finally, that while each country must work out its own solutions, a new organization—an international coalition for democratic renewal—can help provide a more supportive context for these national efforts. Such an organization could help revitalize the democratic ideal, wage the battle of ideas against democracy’s adversaries, and serve as a forum for exchanging ideas across national borders about the best ways of meeting today’s challenges to liberal democracy. Seventy years ago on June 5, US Secretary of State George Marshall gave a speech at Harvard University. Few speeches in modern times have had as much geopolitical consequence. In just eight paragraphs, Marshall made the case for significant US involvement in Europe’s economic reconstruction after World War II. Within 10 months, the United States passed the Foreign Assistance Act of 1948. 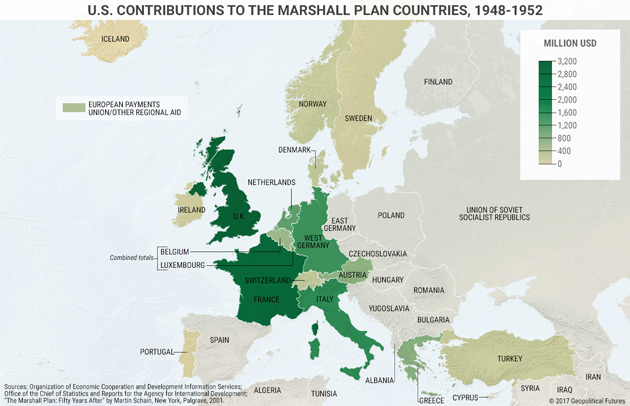 Better known as the Marshall Plan, it provided over $13 billion to 16 European countries (approximately $150 billion in 2017 dollars). According to the Congressional Research Service, the annual appropriation in 1949 alone accounted for 12% of the entire US federal budget. The Marshall Plan became a significant instrument of American power. It represented a substantial sacrifice for the US, but one that paid dividends long after the US stopped providing funds to Marshall Plan recipients. At a time when the world is divided on the merits of nationalism versus internationalism, it’s worth reflecting on why the Marshall Plan worked. Marshall made two key points in his speech to Harvard graduates. The first was the call for the rise of technocracy. Marshall said rebuilding Europe was a task of such “enormous complexity” that it had become difficult for “the man in the street” to make sense of the situation and what had to be done. His second point was that rebuilding Europe was in the United States’ economic interest. The return of “normal economic health in the world” was the precondition for political stability and peace. It couldn’t be offered piecemeal; it had to be backed by the full faith of the US government. In effect, Marshall announced that the US was open for business. European countries heard the message and lined up. By economic indicators, the Marshall Plan was a success. According to the Congressional Research Service, by the end of 1951, industrial production for participating countries had increased by 64%, and gross national product had risen by 25%. European countries set up entities like the Organization for European Economic Co-operation (which would later become the OECD) and the European Coal and Steel Community (the forerunner of the European Union). But more important were the steps taken toward greater Western European integration. As Marshall said in his speech, at stake was a fundamental US interest: political stability and peace on the European continent. The Marshall Plan was not American charity; it was US strategy. Rebuilding Europe with US dollars and remaking it more in America’s image was the tactic the US used to achieve the strategic end of limiting the spread of Soviet power. This was the heyday of what is now called liberal internationalism, a doctrine that argues for the intervention of international institutions to promote liberal values. The Marshall Plan is just one manifestation of the types of policies associated with liberal internationalism. The doctrine is most famously embodied in the United Nations, NATO, and the European Union. These are massive, well-known institutions—the faces, really, of liberal internationalism—but it shouldn’t be forgotten that they are made up of individual nations. The United Nations was formed on the basis of the national sovereignty of its member states. This was the compromise embedded in the institutions the liberal internationalists created: Global bodies that used national power to promote liberalism throughout the world. But bureaucracy has a way of taking on a life of its own. After the fall of the Soviet Union, some international institutions saw an opportunity to take integration further. That the Cold War had been won seemed to validate their legitimacy. There was, however, another interpretation: that the Soviet collapse meant the mission had been accomplished and that the extraordinary circumstances that had defined the post-World War II world were no more. The international institutions had served their purpose, and the world could finally return to state-to-state relations rather than concerning itself with alliances against a potential enemy. These competing conceptions are straining the institutions that liberal internationalism dreamed up. US President Donald Trump’s decision to withdraw the United States from the Paris climate agreement has dominated headlines in recent days. Before that, German Chancellor Angela Merkel suggested that Germany, and by extension, Europe, could no longer rely on the United States. Meanwhile, the disparate interests of EU member states have grown beyond Brussels’ ability to harmonize them. This is not an unprecedented moment or a sign of the apocalypse. It’s the return of history. The US and Germany have different interests. Europe is a diverse continent of many different nations and has never been united under one banner. The US has resumed its traditional wariness of international agreements and suspicion of international obligations. There is no Europe to rebuild, and there is no enemy to defeat. If George Marshall were speaking at Harvard’s 2017 commencement, he would be unable to find an issue to discuss that is as dire today as the need to reconstruct Europe was in 1947. There is no single issue today that requires America’s undivided attention, but rather several smaller issues that require America to divide its attention. After World War II, Europe was beset with problems in search of solutions. It found the solutions in collaboration through newly minted international institutions. But these institutions have become solutions in search of problems. On this June 5, then, it is useful to consider what made the Marshall Plan so successful. It was rooted in the national interests of all the countries involved. Its goals were clearly articulated. Its strategic interests were readily apparent. Its administration was focused, and its implementation well defined. There were mechanisms for accountability and enforcement. These are the things that must be considered when evaluating the strength and viability of an international institution or agreement in the future. - Something big happened in the Mideast on Monday, and whether or not your interest was piqued, you should at the very least make yourself aware of the basics. - Here's a quick recap of the market response, which was quite dramatic. - Bottom line: this market needs another geopolitical crisis like it needs a hole in the head. Ok, so I feel like I'd be remiss if I didn't pen something quick for this platform on what happened in the Mideast on Monday. I won't spend a ton of time on it (if you want the full treatment, it's available here) because it certainly occurs to me that the vast majority of readers likely aren't all that interested, but regardless of your interest level, you should at least be cognizant of the basics because the story underscores how quickly the geopolitical landscape can shift and how those shifts impact markets. So, Qatar has found itself at odds with its regional partners at various times over the years for a number of reasons. Again, you can read the details in the post linked above, but for our purposes here, just note that the tension came to a head late last month when Qatari state media ran a series of comments purportedly delivered by emir Sheikh Tamim bin Hamad Al Thani at a military graduation ceremony. Those comments included conciliatory remarks about Iran and Hezbollah. Needless to say, the Saudis weren't pleased, and although Doha was quick to deny the entire thing, blaming hackers for spreading "fake news", the genie was out of the bottle, and before you knew it, the situation spiraled out of control, culminating Monday in Saudi Arabia, Bahrain, the United Arab Emirates, and Egypt cutting diplomatic ties with Qatar. What it looks like (on my end anyway) is that some folks who shall remain nameless saw an opportunity to tie Qatar to both Sunni extremism and Iran's regional power grabs in Syria and Yemen. So, basically, this allows the Saudis to pretend like they're taking steps to combat Sunni extremists by scapegoating Qatar, and they've been able to get other regional players on board by crying foul at Al Thani's maybe real, maybe make-believe friendly gesture towards the Iranians. Why should you, as a US investor, care about this? Well, for one thing, the geopolitical landscape didn't need to get any messier. This makes the already convoluted proxy wars in Syria and Yemen even more convoluted, which in turn makes it even more unlikely that the regional will stabilize anytime soon. Further, it could very well have implications for the OPEC deal. 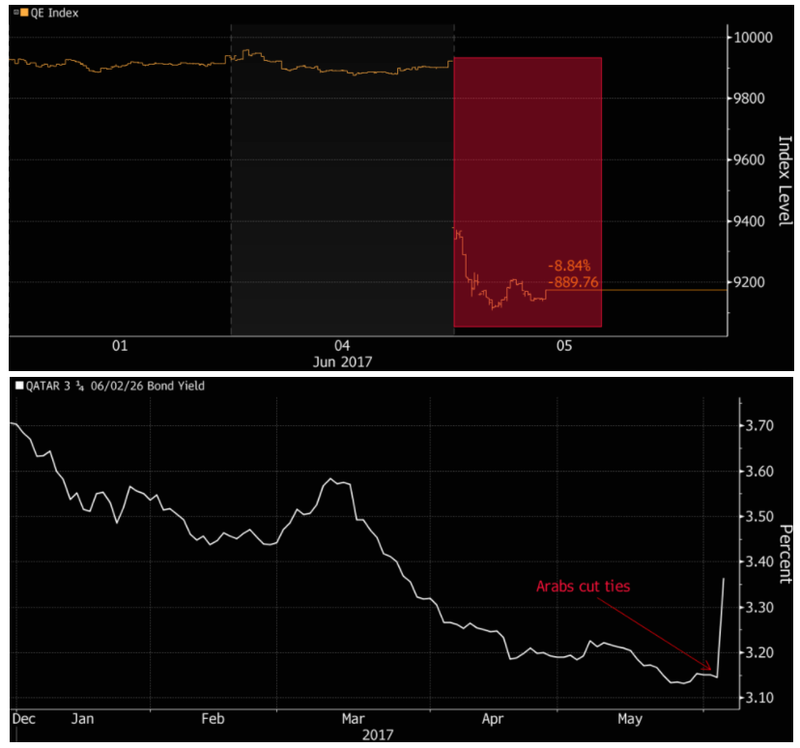 But drilling down, this wreaked all kinds of very real havoc on financial markets in Qatar (NASDAQ:QAT) on Monday. Do note that this was no laughing matter. For context, that was the steepest decline for stocks since 2009. Not a single one of the index constituents' shares rose on the day. Volume was 50% more than average, and by the time it was over, $9.2 billion was wiped out. This was a bloodbath - plain and simple. No hyperbole necessary. Analysts are still sorting through the wreckage to figure out what this might mean going forward, and leaders are scrambling to prevent this from spiraling even further out of control, but the point is, this is not some poor country tucked away in a part of the world no one cares about (at the risk of coming across as crass). What happened on Monday has major geopolitical implications which in turn means it's something you, as an investor, should at the very least keep tabs on. Because again, this market needs another geopolitical crisis about like it needs a hole in the head.